Nina Simmons joins the Greater Phoenix CVB as online marketing manager. Simmons has a well-rounded background in marketing, public relations, communications and digital strategy. Most recently, she worked on the Pickens Plan campaign, which has been recognized for its groundbreaking use of social-media tools to organize and activate more than 1.5 million supporters. An avid supporter of her community and local businesses, Simmons co-founded CenPho.com and takes time to help local businesses harness the power of social media through speaking engagements with Local First Arizona. The Arizona native describes herself as a fashionista, social butterfly and urban adventurer with a soft spot for furry, four-legged companions. Trish Hendrickson, who has worked at the Greater Phoenix CVB since June 2008, accepted a promotion to the position of communications coordinator. She had previously fulfilled the role of communications assistant. In her new position, Hendrickson will handle media relations as well as promotional efforts to encourage business and leisure travel to Greater Phoenix. Hendrickson is a 20-year resident of Arizona and graduated from Arizona State University in 2009. 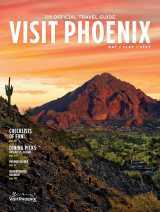 For more information about the Greater Phoenix CVB, visit www.visitphoenix.com.